Sep 05, 2016 Hello, Thank you for your feedback. We are happy to hear you are a strong supporter of our product and company. 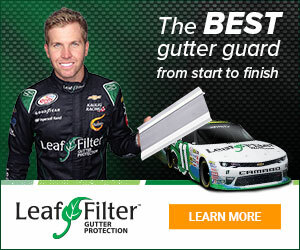 Consumer reports did a 16 month study on Pro installed gutter protection, in the end Leaffilter killed everybody period. Google it Sept 2010 is the issue. Some but not all of the people that post on here work for one of the dozens of other companies that Leaffilter is killing in the market place. Readers be careful. Leaffilter is a great company with a great product at a competitive price and that's easily verifiable. When we have a valid complaint, its been my experience, we deal with it quickly and efficiently. We value out reputation too much not to. When you fight your way to #1 in an industry you get haters. Review #334987 is a subjective opinion of User334987. If you were as wonderful as you do say so yourself, in ten years you would be a well known household name instead of relying on one outdated article. If your product was he benchmark you wouldn't have new and improved versions and to *** with the paying customers with the failed beta versions. notice how "Chris C" identifies himself as "anonymous" in the opening of his comments, but ends up showing his hand as an employee of the company.....just reread the last couple of sentences and you will see what I mean.........just more LIES from a company that truly has NO SCRUPLES, and teaches their employees to forget anything that show any integrity or honesty...."LIE FOR THE BUCKS" would be a much better name for the entire company and their training programs.. If you take the time to read the while article you will find that Gutterglove was the highest rated product and cost $10 a foot less. I got the low-down from one of your reps at a show. He said I should see the "#1 Consumer Reports gutter guard". He told me they tested hundreds, but later I found out they actually only tested about 16. Also, your guy pushed really hard saying you couldn't go under the shingles with a gutter guard or I'd void my roof warranty. He made it out to be very frightening if you touched a roof. I signed up for an estimate based on this. Then I found my way through the show to the MasterShield booth. They said they were from the same inventor, a newer version of the technology. They also had letters from GAF and Owens Corning for me to look at that they could go under the shingles and wouldn't void the shingle warranty as you claimed. Are you "killing the competition" with misleading information just to scare people into choosing your product? I went back and cancelled my estimate. Since I have a choice, I chose the new version rather than the old one. Shame on you for your tactics, especially with someone on a fixed income. They only tested 16?!?! Wow. That's sarcasm by the way. Master Shield isn't the same. It has an aluminum base and a steel mesh. Hey Einstein Google what happens when you have 2 different metals working together. Master Shield is garbage. You are misleading people if you read the full report from Consumer Reports it says and i quote! Though all were impressive at shedding debris, even the top-scoring Leaf Filter screen was only middling at containing a severe downpour.